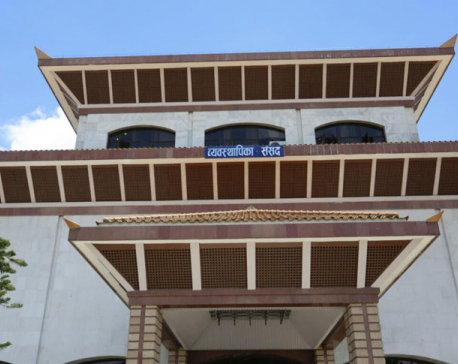 KATHMANDU, June 13: Parliament's Development Committee has asked government to scrap bodies of similar nature such as town development committees saying that existence of parallel bodies had caused duplication and other complications in carrying out development activities. The committee at a meeting held at Singha Durbar on Monday asked the government authorities to immediately end the situation saying that various bodies have become irrelevant mainly because elected local body representatives have already started their work. The committee also suggested the government make necessary adjustments so that the local bodies do not feel any shortage of staff for carrying out development activities. Dinesh Thapalia, secretary at the Ministry of Federal Affairs and Local Development, said that committee's decision is well-timed as the local bodies have got their elected representatives. According to him, the decision has paved the way for scrapping of the bodies like Municipal Development Committee including the Kathmandu Valley Town Development Committee and other similar committees mainly in urban areas across the country and transfer the manpower to the local units. "Since the introduction of the Local Governance Act two decades ago, such development bodies have become reduntant and jobless. And these bodies have become a places for political parties give jobs to their loyalists and cadres," said Thapalia. He also said that his ministry has been working to bring a proposal to scrap such bodies legally and transfer the resources to the local units. According to him, Public Accounts Committee, another committee under the parliament, had also asked the government to scarp such bodies around a month ago.